Dropping in from outer space! This week the bus finds itself in Adelaide, home of Hahndorf, The Barossa Valley, and Ben Folds! Eeek! 1. User selecting an account name from a drop-down list populated by my AD web service, and entering an email to send the report to. 2. Submitting form to a web service which is exposing a BizTalk orchestration. 3. 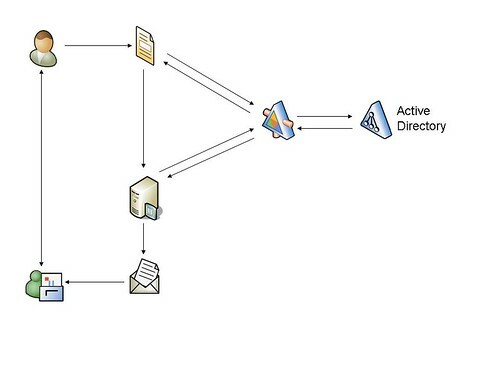 The BizTalk orchestration calls the AD web service, and resolves the account name to First Name and Last Name. 4. BizTalk creates the resolution report, and then submits it through a custom pipeline that converts the report to an InfoPath form, and sends it as an attachment. This demo covers a typical scenario where the InfoPath form needs to call a web service, and the BizTalk orchestration then needs to call a web service. Also it covers BizTalk creating a new InfoPath form instance, and sending this to someone as a mail attachment.